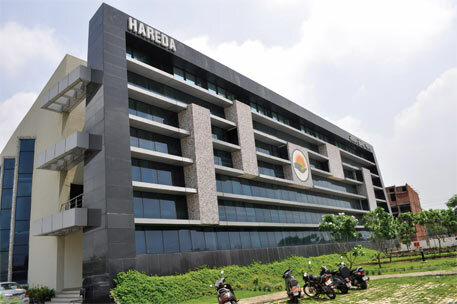 The office building of the Haryana Department of Renewable Energy in Panchkula has tweaked the age-old design of courtyards to beat the blistering dry heat in north India. As a result, the building maintains a temperature of below 30 degrees during peak summers—with little dependency on air conditioners. Akshya Urja Bhawan (AUB), which became operational in December 2012, has been designed with a courtyard in the centre and offices around it. The courtyard is kept cool and the air from it is fed into the building. The courtyard is covered with sunshades on top that stop direct sunrays from entering it. “The building has been fitted with a misting system which sprays water into the courtyard,” says Siddhartha Wig, principal architect at The Elements, the firm that designed AUB. The misting arrangement works as a giant evaporative cooler popularly used in north India to cool homes in summer. All rooms in AUB are connected with solar chimneys that are vertical shafts with a heat-trapping mechanism fitted on top. During the day, the temperature towards the top of the shaft increases, forcing hot air to escape from it. This creates a suction pressure inside the shaft, which draws air from the bottom of the chimney which has an opening in the room, setting in motion a reverse stack effect, pulling air from the courtyard. “Misting is done only during the dry season and is discontinued during monsoons when humidity is high, but ventilation via solar chimneys happens throughout the year,” says Wig. 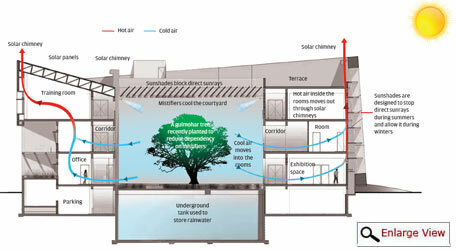 This system effectively maintains 25 ± 5 °C temperature in almost three-fourths of the building. As a result, air-conditioning is limited to just 1,200 sq m of the 5,111 sq m building. A gulmohar tree has been planted in the courtyard, which, once fully grown, will transpire and reduce the dependency on misting. "Our water management system has worked so effectively that after last year's monsoon, which filled the water tank, we have not taken water from the municipal supply"
The cooling system in AUB uses only a fraction of water that a regular chiller plant for air-conditioning system would use. The building uses water-efficient fixtures and drip irrigation for landscape to further reduce its water footprint. It also collects rainwater which is stored in a 625,000-litre underground tank. The rainwater is treated and used for drinking, HVAC (heating, ventilation, and air conditioning) and horticulture. The building also has an effluent treatment plant for the water collected from kitchen and toilet, which is reused for horticulture and flushing. Solid waste from the building is directed to municipal sewer line. “This water management system has worked so effectively that after last year’s monsoon, which filled our water tank, AUB has not taken water from the municipal supply,” says Wig. Walking around AUB one realises that the building does not sit square on the site as a typical building does. “The distortion in the form of AUB is to increase the exposure to north and south directions while limiting the exposure in east and west,” says Wig. East and west are the worst direction from the perspective of solar heat entering the building. The exterior walls on the east and west sides have been constructed using cavity walls with foam insulation to reduce heat gain. “Windows are mostly avoided on the east and west facade and the ones which are there have been designed to face south to ensure daylight. The courtyard also allows more natural light inside the building. All workplaces in the building are lit naturally during the day,” says Wig. The design, he says, has allowed the building to have a modern glass look without compromising on energy efficiency. “The south facade is covered with inward sloping solar reflective glass. The facade is punctured with deep horizontal sunshades to ensure that the glazing does not trap heat,” says Wig. The sunshades are placed at an angle that they block the summer sun, while allowing the winter sun to enter the building. The sunshades are lined with white mosaic tiles to reflect the incident heat back into the space. The roof of the building is covered with special reflective white tiles that reflect heat and insulate the roof. The energy performance index (API) of the building is under 15 kWh/sq m/year, according to green building rating system griha. Operational data of AUB for the first six months of 2013 available with Down To Earth shows that the building consumed 21,576 kWh of electricity, which indicates that the operational API, calculated after a year, might be lesser than the griha estimation. The Bureau of Energy Efficiency’s star rating benchmark for a five-star building of AUB category is 40 kWh/sq m/year. The building has a 42.5 kWp solar photovoltaic array installed on its rooftop. The rooftop solar system can generate enough power to meet AUB’s electricity demand. The green building was built at a cost of Rs.23,672 per square metre, which is similar to the average construction cost of conventional buildings. Though highly energy efficient, AUB is meant for only 55 officials and has accommodation arrangement for 14-15 people. Wig admits that the per square metre energy consumption of the building is very low, but if looked from per capita perspective it is not as efficient. “The current standards are based on built-up area and don’t reflect the actual energy footprint of people using the building. There is a need to introduce a new parameter of people in this calculation,” says he. I used the word rural cold island effect synonymous to urban heat island effect in global warming concept and published few years back. Also I used this in Vaastu book published in 1997. Also the Chinese vastu -- Feng Shu [wind & water]-- presents cooling effect. In those parts of China around 6 months present 24 hour Sunlight. To reduce the heat effect and create cold effect -- they put a nallah in front of the houses on the southern side and fill with water and close northern side to avoid winter 6-months cold winds. Even our Kings used to dig around the fort and fill this with water -- to serve duel role. WMO published a fact sheet in which presented several models of cooling effect. Even our temples were built in this mode. All these are presented in my Vastu book.